Smylist – Smile Design - Poncz Dental fogászati rendelő és precíziós szájsebészet. Do you want to laugh with beautiful renewed teeth? This desire is now available with the help of ’smile design’ procedure. What does Smile Design actually mean? Smile design is the planning and pre-visualization of the desired end result of an esthetic dental treatment targeting a more harmonious state instead of the current disharmony, according the rules of facial, smile, tooth and gingival harmony and the individual needs of the patient, paying particular attention to the functional aspects and the feasibility. How does Smile Design work? High- resolution photos are taken of your face and teeth. 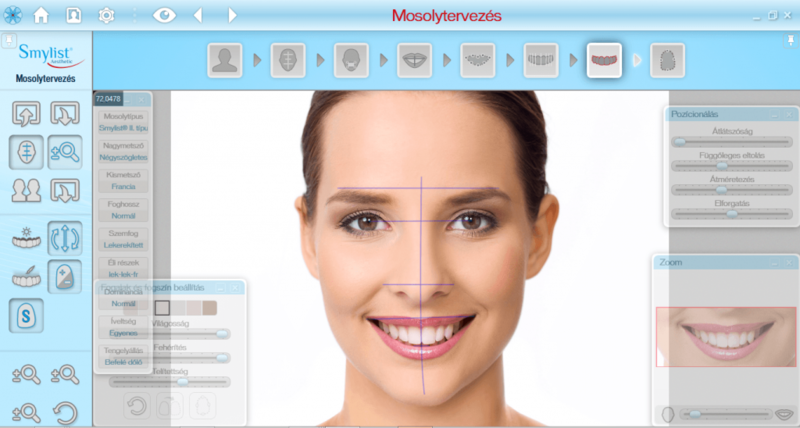 Based on your preferences, your new smile is designed with the Smylist Professional smile design software. Preparation of treatment plan for the perfect result. Furthermore implant works, smile makeover, orthodontics or other related methods may be necessary depending on the dental condition. Esthetic aspects and functional requirements also contribute to achieve a healthy and beautiful, long-term result. Your new, healthy and truly harmonious smile is waiting for you!